Tensioned suture device has been described successfully for hallux varus corrections. 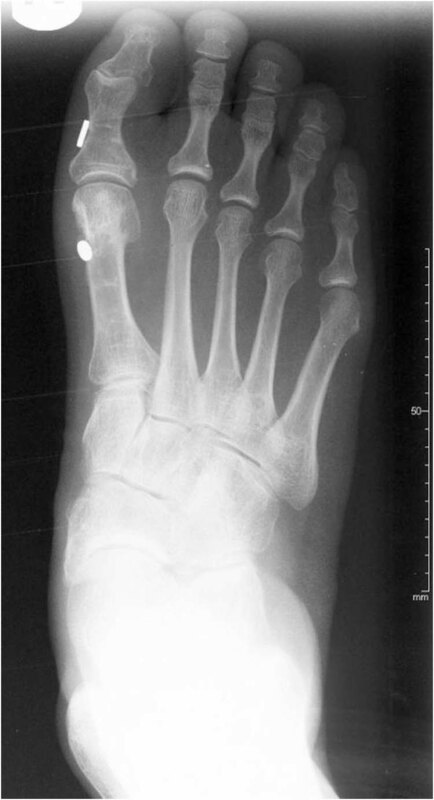 A case report is presented of a flexible hallux varus correction with tensioned suture device. Transverse plane component of flexible hallux varus was successfully corrected; however, a previously mild extensor hallucis longus contracture worsened postoperatively and led to recurrence of hallux varus. Key Words: Tension suture device, hallux varus, surgical complication. This case report is presented to discuss use of TSD to correct the transverse plane deformity of HV, while a sagittal plane deformity worsened postoperatively. A 46 year-old female presented with bilateral hallux pain and difficulty fitting into shoes. She previously received right bunionectomy 25 years ago by another physician, which included fibular sesmoidectomy. (Fig 1A and 1B) The time of HV development is unclear but fitting into her shoes became increasingly difficult in recent months prior to clinic visit. Her reducible HV was dominated by pain-free adduction, with flexible asymptomatic hallux malleus (HM) without EHL bowstringing on exam. Her HV was classified as Type 2A HV- adduction component with flexion at hallux IPJ – under the Clinical Practice Guideline of First Metatarsophalangeal Joint Disorder Panel Classification. The patient had tried taping and shoe gear changes previously, which provided limited relief. Right HV correction was performed with Mini TightRope® (Arthrex Inc., Naples, FL) system, an implanted fixation device with suture and button (FiberWire®, Arthrex Inc.). A dorsal bunionectomy incision centered over 1st MTPJ was used. 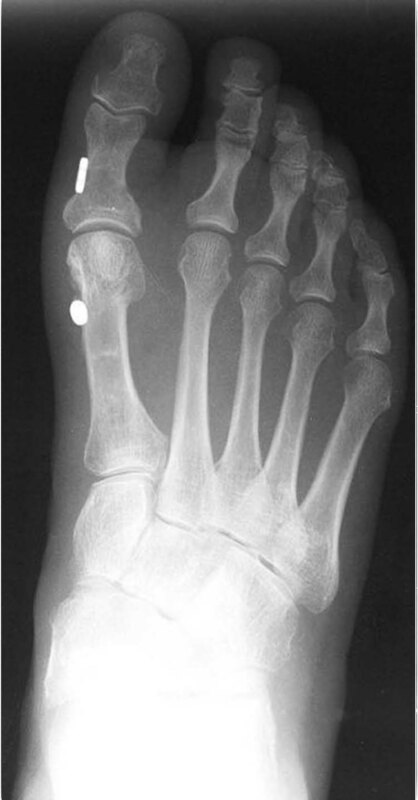 Standard bunion dissection was achieved with linear medial capsulotomy was used. Guide wires and Mini TightRope® were placed as described in technique described by Gerbert, et al.,6 with drill holes being placed parallel to weight-bearing surface. Buttons were applied such that the distal and proximal anchors lie within the same transverse plane. (Fig. 2A and 2B) Surgical site was closed in layers and skin was closed using non-absorbable suture. Figure 2A and 2B Two week postoperative radiograph of right foot. A Dorsal plantar view (DP) shows 6° hallux abduction angle. (A) The lateral radiographs shows suture anchors placed in transverse plane parallel to weightbearing surface. Hallux malleus (HM) is reduced after correction of HV with TSD. (B) There is radiographic artifact in calcaneus. Intraoperative correction of HV was achieved and HM had appeared to improve after HV correction. (Fig. 2A and 2B) Patient was allowed to heel-touch weightbear after surgery with use of postoperative shoe. Correction was maintained at 2-week follow up. Sutures were removed at 2-week postoperatively and she was transitioned to running shoes with activities as tolerated. At the 4 week postoperative visit, she began to develop mild recurrence of HV with mild HM. (Fig. 3A and 3B) Distal suture anchor seems to be shifted dorsally (Fig. 3B) as a result of rotation caused by recurrence of mild HV. EHL became bowstrung over first ray on exam. During subsequent follow up visits, new plantar first metatarsal pain and symptomatic tightness over the EHL were described, while mild recurrence of HV remained clinically reducible. 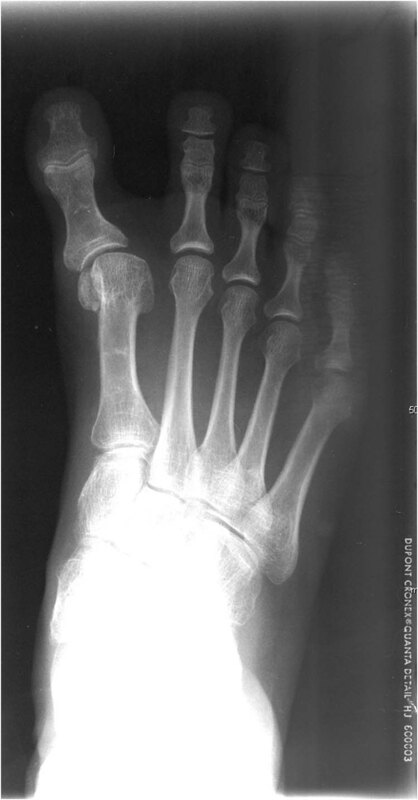 Figure 3A and 3B Four week postoperative radiograph of right foot. The dorsal plantar view showing 1.5° hallux abduction Angle. Distal suture anchor rotated within frontal plane. (A) The lateral view shows the distal suture anchor more superior, secondary to rotation of proximal phalanx with recurrence of HV and dorsiflexion at first MTPJ from the hallux malleus. (B) Again, radiographic artifact is seen in the calcaneus. Use of TSD remains a viable option for HV correction, when 1). Patient’s bone stock is adequate, 2). Patient’s first MTPJ is absent of arthritis or has low-grade arthritis, 3). Patient’s tendons about the first MTPJ, is not the deforming force. A patient with the aforementioned criteria, presenting with a reducible, flexible HV with only transverse plane deviation is most appropriate for HV correction with the described TSD technique. In the senior author’s experience (B.W. ), TSD provides more control over the amount HV correction and is technically easier than soft tissue transfers or osteotomies. It is unclear if progression of the mild sagittal plane deviation could have been prevented with more aggressive bandaging or aggressive range of motion with physical therapy. The technique that was used corrected the adduction deviation of a flexible Type 2A HV, but the TSD could not prevent deviations in other planes. Application of TSD to correct for multi-planar correction has yet to be described. Possible biplanar HV correction using TSD may be considered. 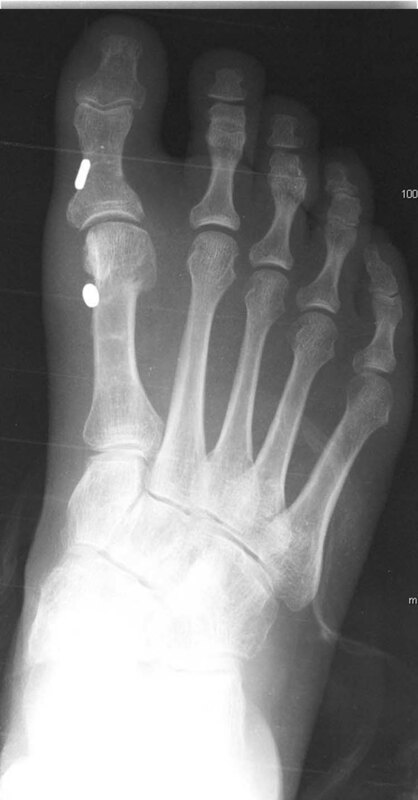 This would require placement of the first metatarsal button more plantarly than the proximal phalanx button, with placement of suture drill holes remaining parallel to the weight-bearing surface. Cadaveric studies of multiplanar correction with TSD will be required prior to clinical applications. Address correspondence to: Francis Chan, DP. Swedish Medical Center Podiatric Residency Program, Seattle, WA. 1 Podiatric Resident Physician (PGY-2), Swedish Medical Center Podiatric Residency Program, Seattle, WA. 2 Attending Physician, Swedish Medical Center Podiatric Residency Program, Seattle, WA. This entry was posted in Uncategorized and tagged hallux varus, surgical complication, tension suture device, Uncategorized. Bookmark the permalink.